Can you believe it's the weekend again? I am so glad! This weekend, I'll be doing my first bit of official wedding planning. Specifically, Eugene and I have an appointment to go check out a possible wedding venue called 632 on Hudson. It's actually my favorite (in theory and on paper and in my daydreams) so I'm very excited and hoping it will be just as fantastic in real life. Fingers crossed, please! I'm also busy planning the menu, decorations, and other details for the Clothing Swap Brunch I'm hosting next weekend at my apartment for a few girlfriends. I'm stoked because I haven't thrown a "girls only" party in several years; the last one was a "ladies who lunch" party I co-hosted with my friend Anne, back when we both lived in DC (she's now in Chicago). Planning for my ladies brunch has me all excited about glass cold beverage dispensers with little spigots. Crate & Barrel has a really classic one on the cover of their latest catalog. Bed, Bath & Beyond has an inexpensive but sturdy looking version. But I admit that my FAVORITE is this charming Mason Jar drink dispenser that I spotted at Pottery Barn yesterday afternoon. In fact, I'm heading over there right after work today to bring it home. The plan is to fill it with gorgeous mint lemonade or perhaps something pretty pink and boozy; just perfect for a ladies lunch! Famous chefs teaching basic cooking tricks: Learn to roast a chicken with Thomas Keller! Chop onions with Anthony Bourdain! Make an omelet with Jacques Pepin! And learn the secret to a classic red sauce from Scott "I hate cheese with fish" Conant. Two new blogs I encountered and instantly fell in love with this week: Apron Anxiety by Alyssa Shelasky and this one (which doesn't really have a name) by Caitlin Dentino, who just seems like a really cool girl that I'd probably like to hang with in real life. You know I plan to bake my own wedding cake, and when I spotted this gorgeous technique, I decided I need to master it. How perfect would this be for our wedding cake? Wicked cool party banners that would work for any kind of gathering. I just love the look of these little lime & ricotta cheesecakes. And I also own those tiny springform pans she baked them in! This chic black & white apron has a very Parisian feel to it. Have you ever tried LaVanilla perfumes? They're kind of amazing! I've been using their scents for the past couple years. I love Vanilla Grapefruit, but my current favorite is Vanilla Passion Fruit. They're wonderful, but beware that they'll leave you smelling rather edible; the office manager at work is forever telling me that I "smell like a cake." Which is just fine with me! I've been reading this book on the subway all week. It's full of wonderful little retro housekeeping and entertaining tips. And I found out there are a whole bunch of these mid-century cookbook facsimiles. I'm adding all of them to my wishlist asap! I can just barely see it in the picture, but I love the look of the limes in the rose water. I have to ask ~ are these real limes? Does the acidic juice help or hurt the flowers? I'd love to try this, so any tips would be much appreciated. Oh, and I love your site! 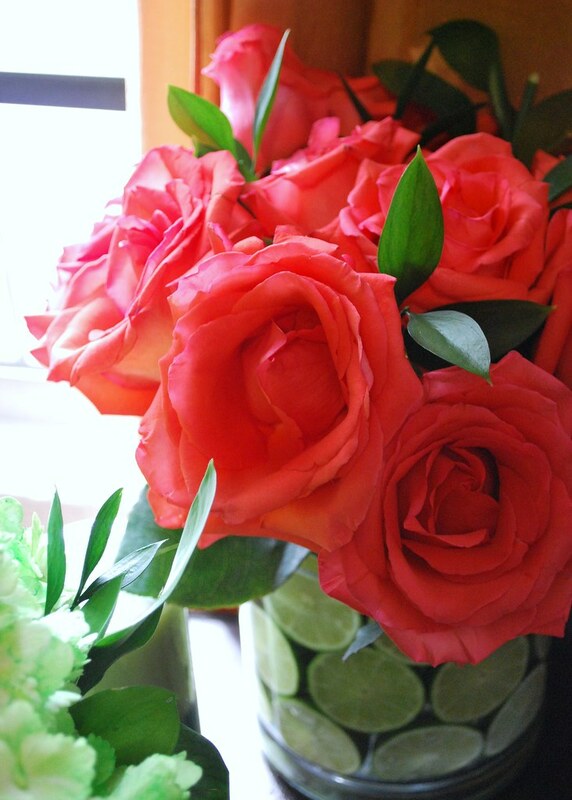 Appetite: I've been meaning to do a tutorial on the rose/lime arrangement. It's actually pretty simple to do and the limes never even touch the roses! What I do is I get a nice big round vase with straight sides (they have them a michaels). The one i have is about 8 inches high and 5 inches in diameter. I then get a large jam jar (like a big smuckers jar) that I rinse clean and remove the label from. I set this in the middle of the vase. the halved limes (or lemons or oranges)are inserted all along the sides of the vase with the cut side facing out. I wedge them around the entire thing so the jam jar is solidly in the middle and totally surrounded by limes. I then pour in room temperature filtered water all over the limes to reach about an inch from the top, and also pour water into the jam jar. The I cut and arrange my roses inside the so all the stems are in the jam jar (not touching the lime water). And that's it!